Oakland County antique auctions are becoming increasingly popular because they are the best place to get beautiful pieces of well made, traditional furniture or unique and beautiful pieces of jewelry, dishware, and art. Many people think that antique auctions are a great way to get furnishings and other vintage pieces for their home, for a cheap price. That, however, is often not the case. While there are good deals to be found at an antique auction, they are not necessarily the place to find “bargain” furniture. Before you head to your first antique auction, here are some things you need to know. Many auctioneers and auction houses will list and allow items to be viewed prior to the auction. If there is a particular piece that you are interested in, make sure you look it over before the auction, and if you can, do your research on the piece. Good research will help you understand if the piece is authentic, and what price you can expect to pay. This doesn’t always mean that the piece will go for the price you are anticipating, but at least you will know what the market price looks like. The same is true for items like jewelry, glassware, dishes, and collectibles. This is especially true for antiques that are highly desirable. Buyers who are looking for a particular piece and collectors who know the market price of items will be prepared to spend market price or more for a particular piece. This is especially true for items with local provenance, rare pieces, and pieces that have a high current value as collectibles. Buyers who are very interested in antiques, or who are trying to furnish or decorate a home with period appropriate pieces, are often willing to spend more than market to get just the right piece. Just because something is considered an antique, doesn’t mean that it’s a great piece. Look closely at items that you are interested in. Make sure that they are in good condition or have not been altered in such a way that they will be unsafe or the value decreased. If you are really interested in a piece, it may not matter to you if it isn’t completely authentic. Just make sure you know what you are getting. This is going to keep you from spending more than you want or can afford. Antiques can be expensive, and many people are willing to pay a premium on a particular piece. Don’t let those people at an auction inspire you to spend more than you want. Whether this means spending above what you can afford or just spending above the limit you’ve set for an item. Set your price, and stick with it. Remember, you will have to pay for your items shortly after the auction, so if you don’t have the funds to pay for what you wanted, you may lose the item. It’s also important to remember that bidding at an auction can be exciting. Don’t let your enthusiasm for bidding go beyond your pocket book. Bid responsibly and remember your price. 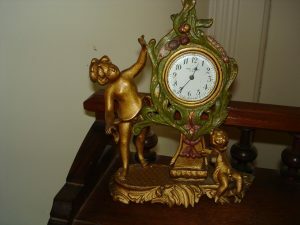 Need More Information on Oakland County Antique Auctions? Antique auctions can be a great place to find that perfect, unique treasure. If you are looking for an Oakland County antique auction or need an auctioneer experienced in antiques, the professionals at Gary M. Berry, Auctioneers – Realtors are here to help you. For information on our services or to get information on current auctions , contact us at (248)299-5959.